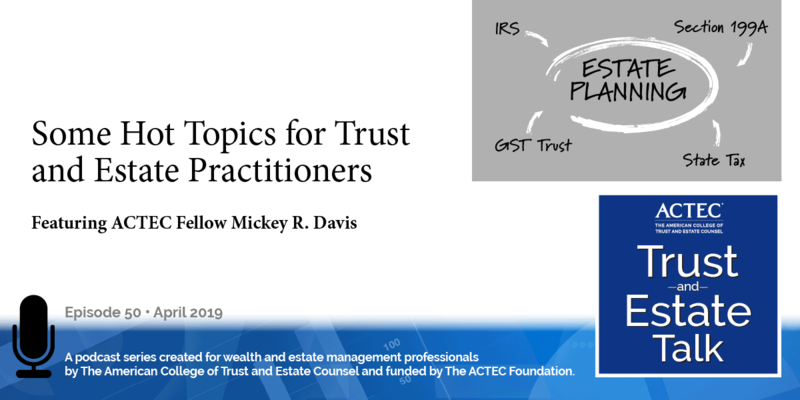 “The Digital Will Revolution.” That’s the subject of today’s ACTEC Trust and Estate Talk. This is Margaret Van Houten, ACTEC Fellow from Des Moines, Iowa. Millennials are known as the disruption generation. Now they are bringing that disruption to an estate planner’s law practice with the electronic will. 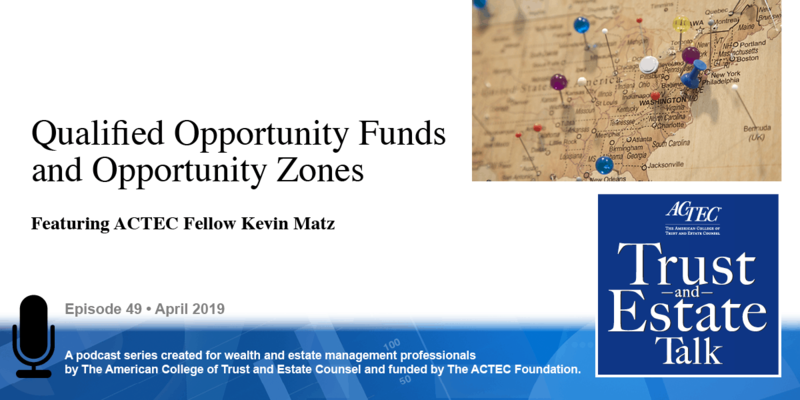 To learn more about this topic, you will be hearing today from ACTEC Fellows Robert Fleming of Tucson, Arizona and Suzanne Brown Walsh of Hartford, Connecticut. Welcome Suzy and Robert. Thank you. Traditional wills are based on laws drafted hundreds of years ago. Needless to say, they did not contemplate and do not address wills drafted on electronic devices or using online services. 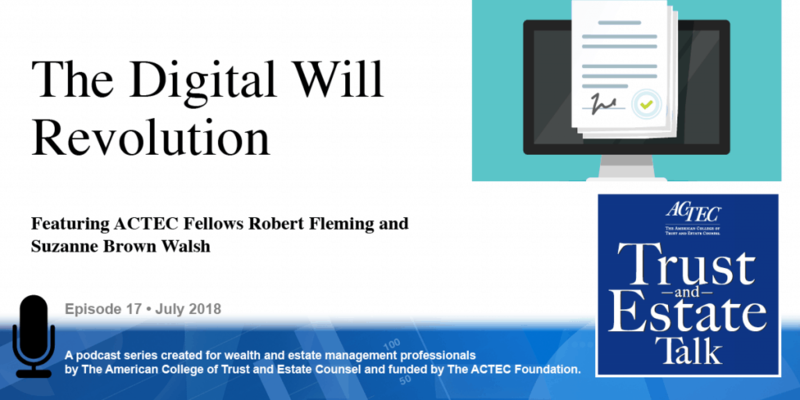 Further, an e-will by definition has to be signed electronically, and the laws governing the use of electronic signatures were drafted to validate electronic signatures to bilateral commercial contracts, not unilateral documents such as wills. 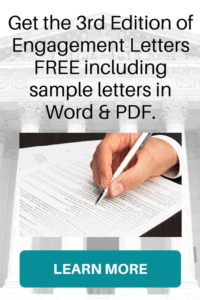 As a result, courts have been asked to determine if wills drafted and signed on tablets but properly witnessed were valid; whether wills printed on paper but signed with a typed, cursive font were properly executed; and, recently, if a will consisting of an unsent text message with a smiley face emoji was a valid will. In order to give testators in courts the tools to determine if such nontraditional wills are valid, wills acts need to be modernized. Bills sponsored by some well-funded startup e-wills companies tend to simply codify a particular business model and emphasize so-called best practices for will execution and storage that arguably should not be codified in the blackletter law. Other issues complicated by the electronic format include revocation and using witnesses who are present by webcam or video and not physically present during the will’s execution. 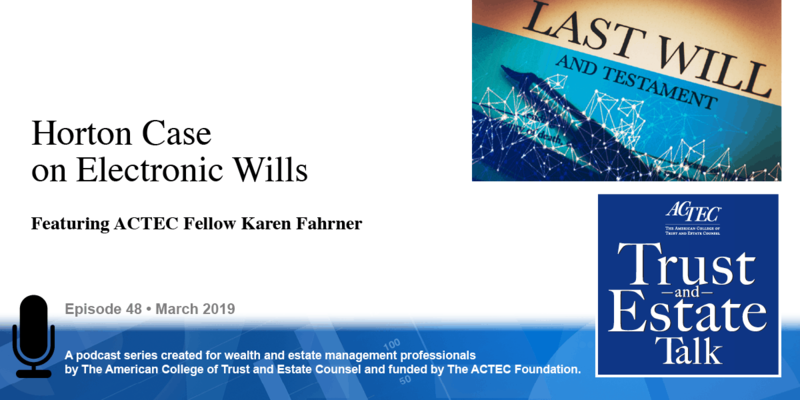 Existing statutes governing the law applicable to determine a will’s validity assume the testator’s physical presence in the state, but do not expressly require it to be applicable. In the new world of remote execution and virtual presence, states must revise their laws if they want validity linked to the law of the state where T executed the will or to T’s domicile or residence at death. Finally, states need to determine who’s going to supervise or police such remote executions if the will is to be self-proving, and thus easier to probate. The Uniform Law Commission’s e-wills drafting committee is happily grappling with all of these issues and expects to have an act finalized in July of 2019, so stay tuned. As Suzy intimates, the notion of electronic wills is definitely an arriving idea, and there’s been legislative change around the country at various spots. There have been a handful of cases that have addressed the kinds of questions that come up. Very recently, we have Indiana and Nevada passing new laws that allow the execution of an electronic will. In Nevada’s case, including the remote execution of an electronic will, other bills are pending in Florida and Arizona and talked about or rumored in Virginia and New Hampshire, and other states, so there will be changes in the law that allow for the remote execution of electronic wills and then for the remote notarization to make a will a self-proving will. Expect that some states will adopt laws that explicitly forbid electronic wills, and then we’re going to be operating in a balkanized system in which some states invalidate the documents that are valid in other states by statute. [Note podcast: State Law Pitfalls: Don’t Step in It When Your Client Steps Across State Lines] That of course is not new; we’re accustomed to that idea, we’ve had years – decades – of experience with holographic wills facing exactly that kind of problem, and so we have the occasional case where a will that is not valid in one state is valid in another if the decedent owned property in both states that raises the question about to the deal with their estate. And it also raises the question of sequence of probate, whether the initial probate is filed in the state that recognizes the questioned document, and then an ancillary proceeding in another state, or vice versa. So we are going to have conflict of law problems to sort out. It’s complicated in the case of electronic wills because of the question of presence. We’ve long made our laws on the basis of the physical presence of the testator, and we’ve said in most states that any will that is valid when and where it was executed is valid in the state where it’s offered for probate – though there are exceptions even to that rule – the notion of an electronic presence is going to make that way more complicated to calculate. So, stay tuned, stay on top of the questions, but do not expect that electronic wills are a passing fancy that will dissipate over time. You will be seeing electronic wills in your practice in the very near future. Thank you both for educating us about digital wills.